WE WERE PLAYING IT WRONG: ARCHER: THE DANGER ZONE! 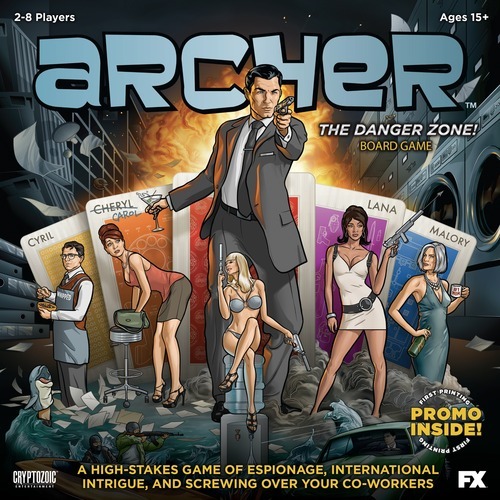 The Basics: Archer: The Danger Zone was published last year by Cryptozoic Entertainment and is based on the popular FX show Archer. Players take control of one of the show’s main characters and then spend most of the game rolling dice and quoting the show’s crude humor, sometimes for victory points, sometimes just because. First player to 20 points wins, which is relatively straightforward except much of the game is about taking points away from other players to delay or deny them victory. There is also a hidden simultaneous action step but it’s so thin as to not be worth explaining. Cryptozoic is an interesting company; their portfolio of games consists almost entirely of board games made using licensed properties. They are the publishers of, among others, Assassin’s Creed: Arena, Adventure Time Card Wars, the creatively titled DC Comics Deck-Building Game, the equally creatively titled Capcom Street Fighter Deck Building Game, and at least three different themed versions of Love Letter (Batman, Adventure Time, and the Hobbit). In short, Cryptozoic doesn’t make board games so much as presents that nerds get at Christmas. This isn’t a bad thing per se, but the games they produce are simplistic and rely heavily on the charms of the license rather than being a good game in itself. I can’t even say Archer or any of the games above are good gateway games, because none of them are fun enough to encourage anyone to want to play or buy another game. What we did wrong: Players complete tasks in the game by rolling dice hoping for a high result. Roll a high enough number and a player passes the check thereby earning victory points. Roll a five or six on a dice and a player also gets a card from their character’s deck of cards. Each of these cards has a hilarious quote on it from the show and usually either gives the player extra victory points or takes them away from someone else. The trouble is that when drawing these cards a player may only play one of the cards they draw and have to save the rest for later. We just played them all. What resulted was a Hobbesian war of all against all that, a few turns later, had the leader up just two points from the starting point and well away from victory. Had we played it correctly, it’s likely we could have had a more dynamic game, but, to be honest, I doubt it. Conclusion: I wouldn’t want to play this again, but then again I’m not a big fan of Archer. To me, this game combines all of the dog-pile tendencies of Munchkin with the bureaucracy of Zombies!! for a complete waste of an hour or two. There are plenty of fun party games with spy themes like The Resistance, Codenames, and Two Rooms and a Boom. Play those instead.